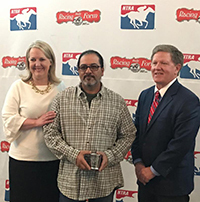 (Grand Prairie, Texas - Thursday, February 2, 2017) - David Bernal of Grand Prairie, Texas finished in the top 10 which earned him $52,000 at this weekend's 18th annual Daily Racing Form and NTRA (National Thoroughbred Racing Association) National Handicapping Championship (NHC) held in Las Vegas. Bernal was one of eight qualifiers from Lone Star Park, qualifying on October 22 in his first year to ever play in a tournament. Bernal, who made his first trip to Lone Star Park in 2009, said it was the only racetrack he's ever visited. He admits he was a bit intimidated by the prospect of handicapping at first. "I went over with a friend that had been there before and had some kind of idea how to do it," said Bernal. "Then I started stopping in on my own, figuring out the different kind of wagers that could be done on the wagering menu and just kind of went from there." Cash was awarded to the top 66 finishers in the 18th NHC finals. To reach the Semifinals, the 654 NHC entrants were required to place 36 mythical $2 Win and Place wagers - 18 on Thursday and 18 on Friday. This is the fourth consecutive year with a three-day format, including the Semifinals and Final Table. After day 1, Bernal was in 185th place. He began Day 2 wanting to "hit early and often" as he knew he "had a lot of ground to make up". And he did, finishing Day 2 in 41st place. Bernal made it to the Final Table, as high as 4th place at one time, but ultimately finished in 9th place which was worth $52,000. "I'm definitely going to be entering (future) Lone Star tournaments," Bernal added. "I feel like I have some unfinished business to do and would like to try and get back there again. I'm still on cloud nine." Lone Star Park's 2017 Tournament Series begins on Saturday, March 11 and will give away a total of eight spots to next year's NHC and give away up to $28,000 in total prize money. It's free to play. More information is available at Lonestarpark.com.